I’m reading Flow: The Psychology of Optimal Experience by Mihaly Csikszentmihalyi (on a sidenote, I bet that last name really hurts his citation count. Misspellings alone must cost him big time). And it’s pretty excellent. I read it once before, when I found it in my dad’s study. But I was like twelve, so all that I retained of it is that there is this thing called flow (which is where you’re completely lost in an activity and time stops and you feel like the master of time and space and the universe opens up and everything’s amazing). What I find interesting is that the book has both a normative and a descriptive component. The descriptive part is just describing flow: when it occurs, how to make it occur, what it’s like, etc. The normative part consists of the assertion that flow is “optimal experience”–basically that it’s the best thing ever, and that the purpose of life is to get into flow. Obviously not a provable assertion, but certainly thought-provoking and more convincing than most philosophical standpoints, because flow is actually extremely pleasurable, but doesn’t have the same downsides as most pleasurable activities. It’s the best kind of pleasure. I am enjoying the book. It resonates with me. I experience flow fairly regularly, both when I write and when I read. For years, writing didn’t involve anything even approaching flow. It was actually extremely painful. But now that I’ve gotten better and refined my techniques, I’m operating on a bit of a higher level. And, true to the lessons of the book, I generally get into flow whenever I’m pushing the limits of my abilities. Anyway, none of that is the point of this article. The point is that at some point the book started talking about your attention and about how, in order to get lost in something, you need to restrict your attention to just the matter at hand. 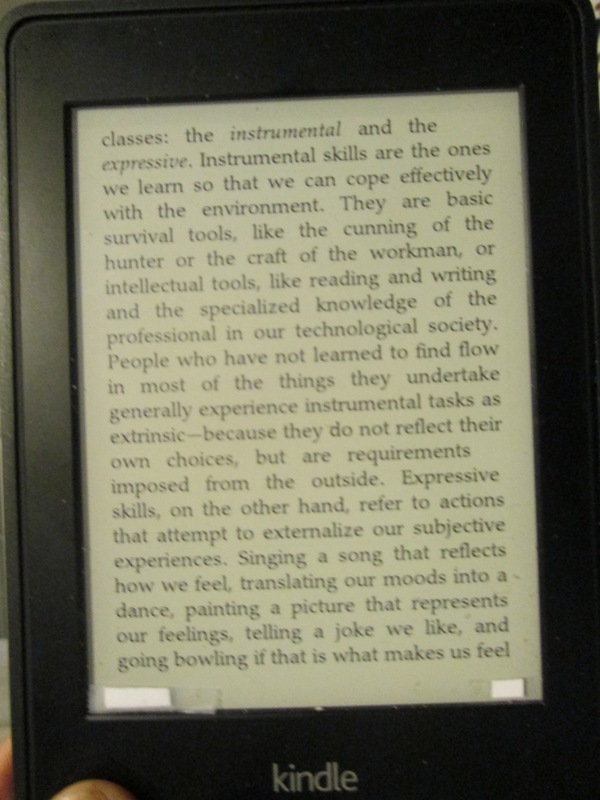 And I realized that I really really really really hate the way the Kindle tells you what page you’re on. I mean, I always knew that I hated it. But now I knew that I really hated it. 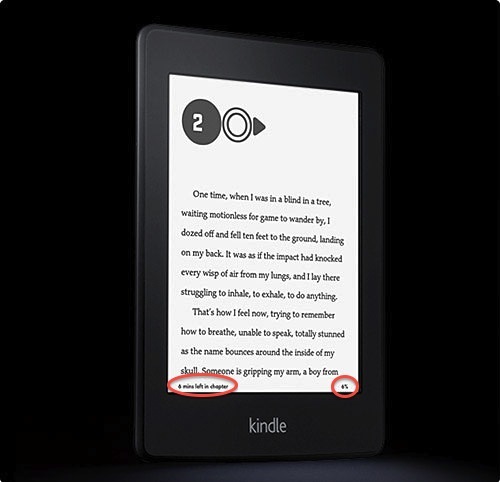 If you don’t use one, then you don’t know: the Kindle has two progress counters. On the left side, there’s a percentage. And on the right side there’s one of four completely arbitrary numbers: time left until you complete the book (based on your reading speed), time left until you complete the chapter, location (a weirdly arbitrary Kindle-centric number that’s usually in the hundreds or thousands), and page number (but this doesn’t refer to actual page turns on your device…it refers to some weird arbitrary page number, so that it might take three or four Kindle page turns to get this number to change). All of these numbers are awful! It’s like they were put in there by someone who doesn’t actually like to read books. The time markers are awful because they focus on when you’re going to finish the book, when you’re supposed to be losing track of time. The location marker is awful because it makes me keep glancing down and performing quick math to see how many page turns it takes to go up how many locations and how many page turns I’ll need to get to some arbitrary location. And page turn is the worst of all, because it just makes me glance down with each page to see if the page turn number has gone up. Oh, and don’t get me started on percentage completion. This was the worst of all, because it made me continually do mathematical operations to try to relate this to the other number and to how many page turns it’d take to make the percentage go up. It took me awhile to figure out why all these number bothered me when the page number on regular books does not. It’s because the page number on a real book increments in an orderly fashion. You turn the page and the page number goes up. There’s no uncertainty there. You don’t need to keep looking at it, because you know you’re just one page above the last page you were on. Anyway, I put down the book, got out some tape, and solved the problem. Since tape doesn’t conduct electricity, it doesn’t trigger the Kindle’s capacitative touchscreen and, thus, there’s no problem putting tape on the screen. This is a great idea! In the book I am reading right now, it takes about 11-12 page turns to advance 1% in the book, according to my Kindle. Why do I know this? Because that stupid percentage bar is completely ruining the experience of reading the book. It’s on my mind pretty much constantly as I’m reading. Gotta get me some tape. Glad to have rescued someone from this awfulness.